On Sunday, September 22, 2013, Pastor Chelsey shared a message from Ephesians 2.1-10 as part of a series entitled “In Christ.” You can listen to the sermon on our current series’ website (or in the archives). We talked about how grace is given to us by God, never earned or “got,” and about how we open ourselves to receive God’s presence, grace, and transformation more than we ought to focus on working to put ourselves in a ‘good position’ for God. Most importantly, we came to the realization that we need Jesus to rescue us everyday. What is grace exactly? Read on. Finally, one of the ways that we can be open to receiving from God is by practicing the spiritual discipline of silence. Pete Scazzero offers rationale and tips, as well as a video of his worshiping community practicing the discipline, on his blog. 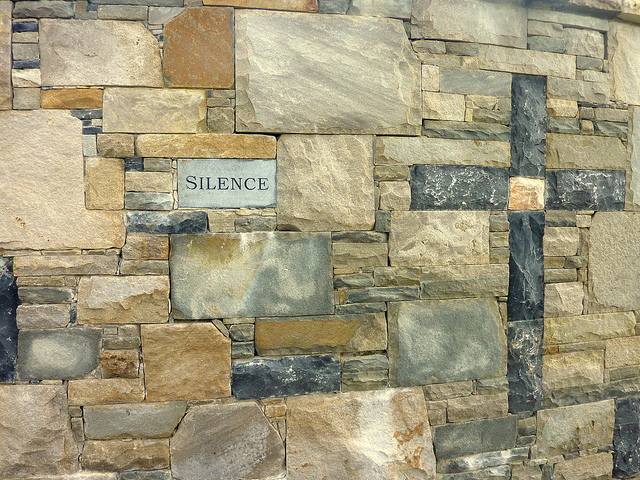 This post talks about grace, the spiritual discipline of silence, and being open to God. It is a follow-up to a sermon preached by Rev. Chelsey L. Harmon at Christ Community Church in Nanaimo, BC. Photo by Sean MacEntee. Used with permission. Sourced by Flickr. On Sunday, July 7th, a group of people gathered to discuss an article from our denominational magazine, The Banner, called “Tomorrow’s Theology.” Because the article argues for some things that go against the tradition and historical teachings of the Christian Reformed Church, we thought it was important to get together and talk. For those interested in continuing to learn about the interplay of Science and Faith, or the Reformed Confessions, the following links should prove as a worthwhile starting point. Origins: Christian Perspectives on Creation, Evolution and Intelligent Design by Deborah Haarsma and Loren Haarsma (formerly titled: Origins: A Reformed Look at Creation, Design & Evolution). This site provides information about the book as well as links to further reading for each chapter. You can read the Heidelberg Catechism, Belgic Confession and the Canons of Dort online by going to the Christian Reformed Church’s “Beliefs” page. The Winter 2013 Calvin Seminary Forum features articles on the history of each of the Confessions. Body & Soul: Reclaiming the Heidelberg Catechism by M. Craig Barnes. Also available is a small group discussion guide and DVD. On March 24, 2013 Pastor Chelsey shared a message from Exodus 15 entitled, “The Lord is a Warrior.” She challenged us to think about God as a Warrior against sin and evil as we headed into Holy Week. Hear that message on our Church sermon website (or in the archives). This post is a follow up to a message preached at Christ Community Church. It provides a challenging reflection to the picture of Jesus we make for ourselves and is a resource for Holy Week and Good Friday. On Sunday, February 17, 2012, Pastor Chelsey shared another of the biblical images of God. You can hear “As a Father Carries His Son” from Deuteronomy 1.19-2.1a on our Church website. “I Will Not Let You Go” is the true story of a father loving, struggling, disciplining and learning about carrying his son– all the while falling more in love with the Heavenly Father. What are the images of God that sustain and encourage you? This post is a follow up to a sermon preached at Christ Community Church in Nanaimo, BC. Yesterday, Pastor Chelsey showed a video called “The Anti-Santy Ranty” from the group 10ofthose.com. Sunday’s message from Isaiah 7.1-17, “A Stable Influence: the Son born Immanuel”, will be available on our church website later this week. This post is a follow-up resource to the Sunday morning service at Christ Community Church.